Virgin Mary, Mother of God, detail. Good Byzantine icons express what the Orthodox Church Fathers call the bright sadness or life-giving sorrow of the saints. Being also icon painters, the mosaicists in our studio know subtle techniques to express these states. 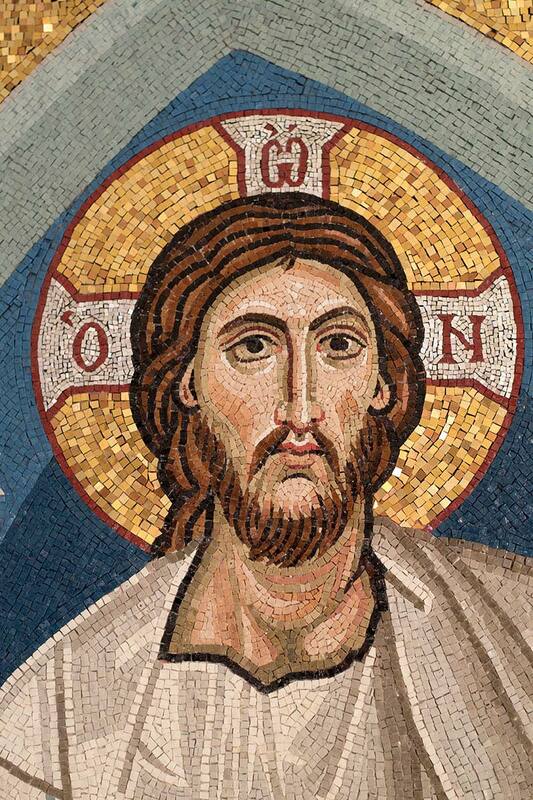 Face of Christ, detail. 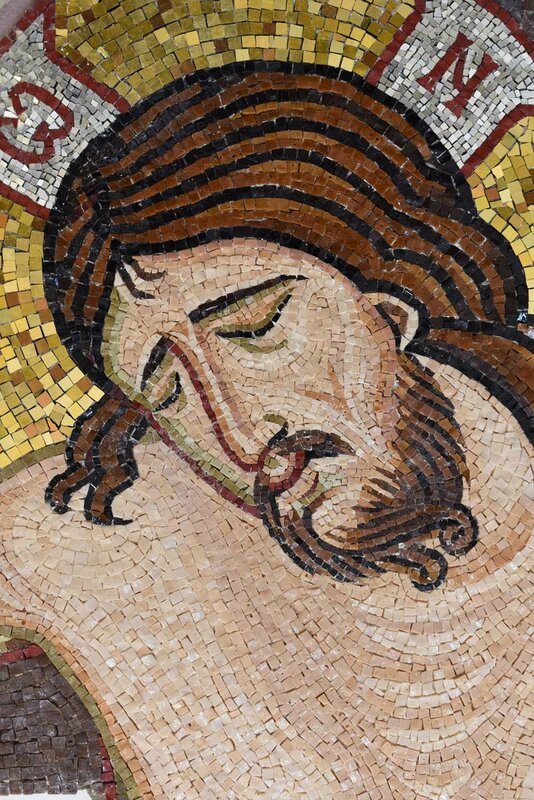 In this mosaic, Christ’s death is likened to Adam’s deep sleep, when God took a rib to fashion Eve. Here in the Crucifixion, the Father creates the Church and Bride of Christ from Christ’s pierced side. Eve, detail. Skilfully made mosaics create harmony and rhythm not only through drawing and colour, but most notably through graceful lines of tesserae called andamenta. 3.6 x 4.8 metres (12 x 16 feet). The parish widened its church’s aisles, which created two new walls. 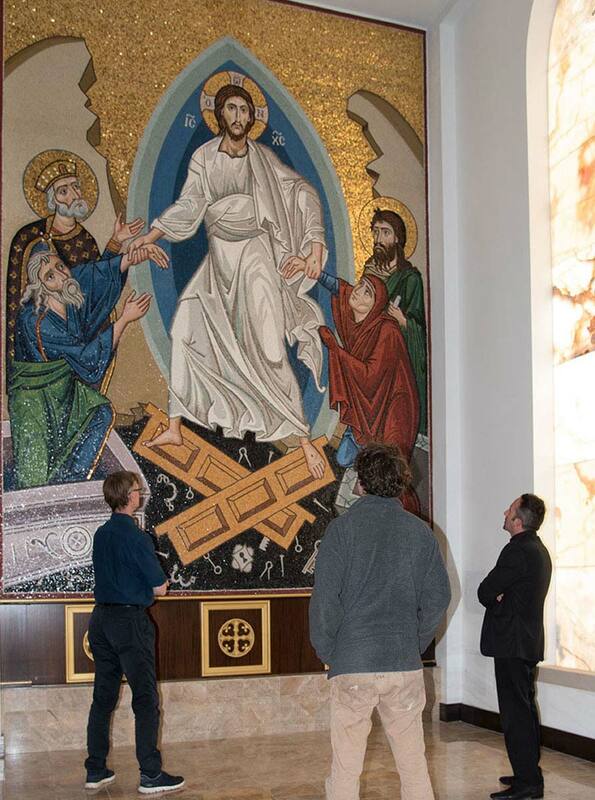 This and the following Resurrection mosaics were commissioned to cover these spaces. They were made in sections in our England studio and then installed in the church over four weeks, with minimal disruption to the cycle of services. The Crucifixion mosaic in the north aisle. 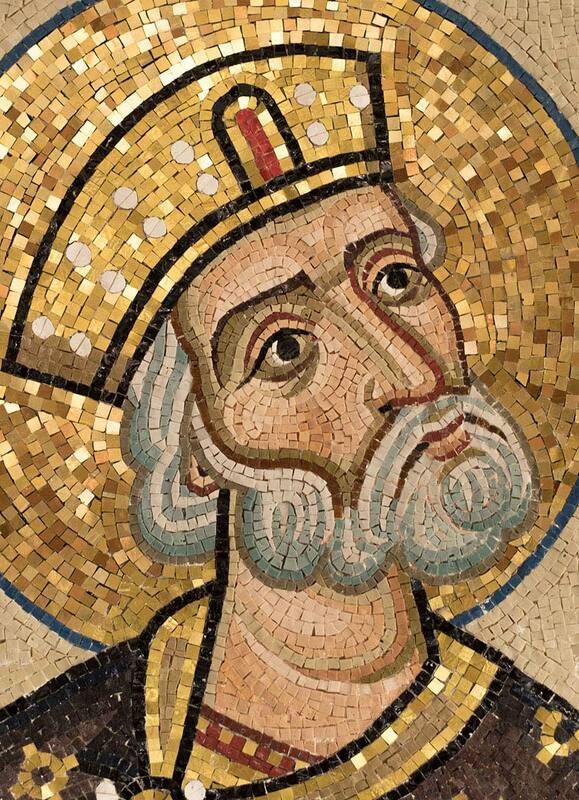 Icons, be they in mosaic or paint, are liturgical objects. They are venerated. They create an atmosphere conducive to worship and compunction. They can also be missionary, drawing people to Christ’s beauty. 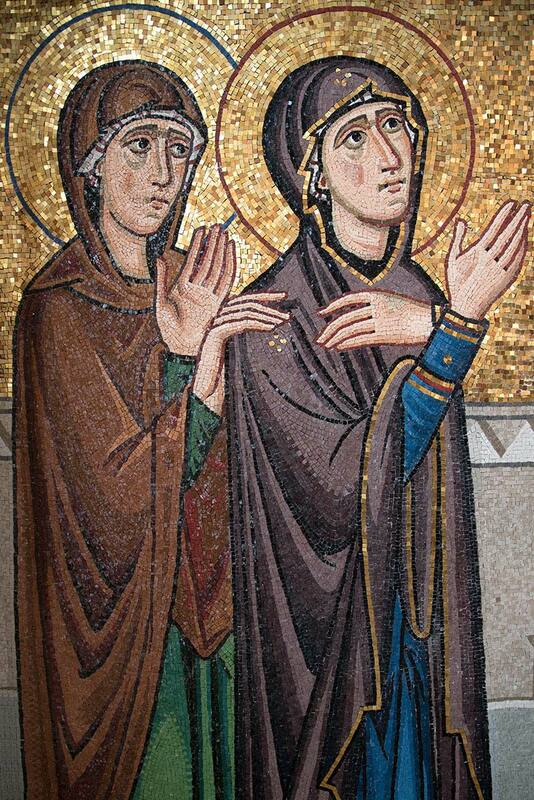 St Mary Magdalene and Virgin Mary, the Mother of God, detail. 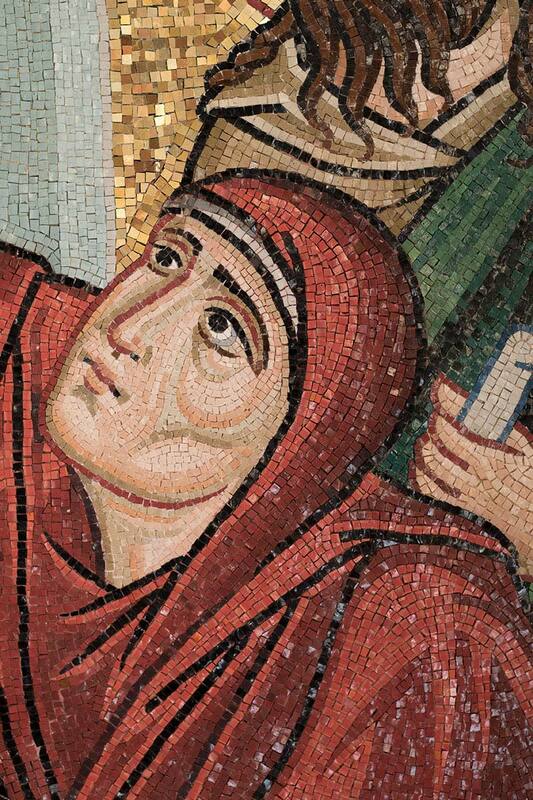 In this mosaic we try to show not only the women’s grief and compassion for the suffering Christ, but also Mary Magdalene’s for Christ’s mother, the Theotokos. Arm of crucified Christ, detail. At Aidan Hart Mosaics we utilize the techniques of masterly Byzantine and Roman mosaics. For example, we surround each member with a “halo” of background andamenta. We combine complementary colours of green and red in the flesh. Unlike lower quality mosaics that use a lot of rectangular tesserae, we plan things to avoid this, preferring the grace and rhythm of cubes. 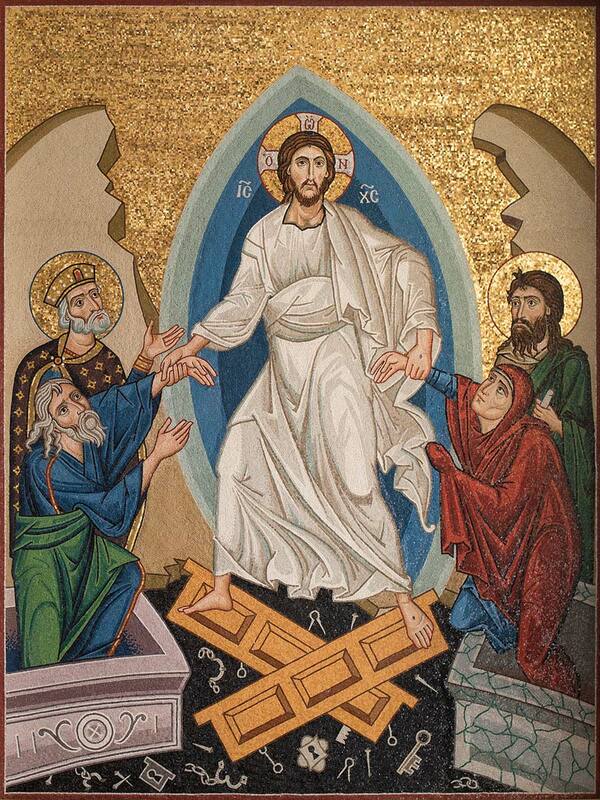 This Orthodox Resurrection mosaic is also called the Harrowing of Hades or Descent to Hades. It depicts Christ delivering the righteous of Old Testament times, in this case, Adam, Eve, St John the Baptist and King David. The rocks are like the jaws of Hades opening, or like the waves of the Red Sea parting. With large mosaics such as this we make the work in sections (fourteen in this case). The joins follow the outlines of figures or objects. In the studio we leave a sufficient area unfinished around the edges so that after the sections have been screwed to the wall in situ, we can fill over the joins to make them entirely invisible. Christ in Hades, detail. Basing it broadly on the famous fresco in Moni Chora, Constantinople, we nevertheless adapted it to suit the particular strengths of mosaic, emphasizing the dynamic lines of the folds. The Greek words O W N are the translation of the Hebrew word Jehovah, and means ‘The One Who Is’, or ‘The Existing One’. Hell took what it thought was merely a man, and found that it had accepted God, and so it was conquered. King and Prophet David, detail. As with other Old Testament prophets, David foretold the coming of the Messiah. In this mosaic, he finally meets Him, face to face. King David and Adam, detail. 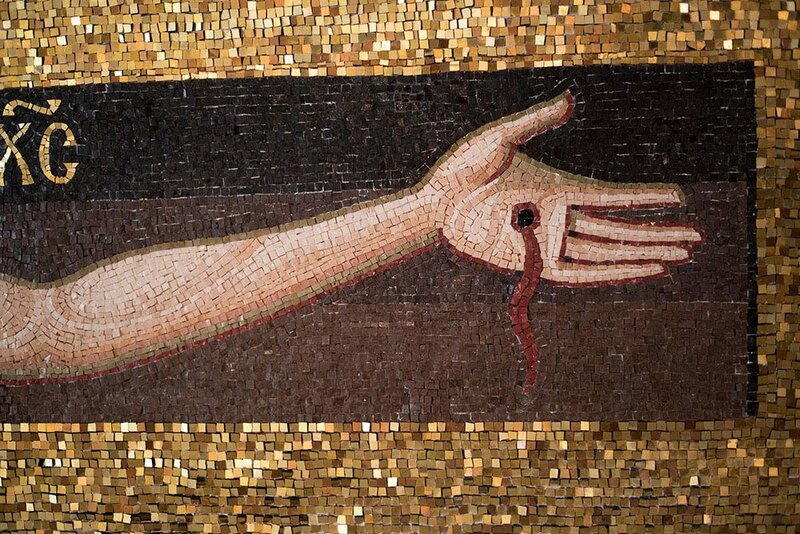 This mosaic depicts Christ taking Adam by the wrist, to show that God has taken the initiative to save us. Adam, detail. Although it is possible to imitate all the detail of a painted icon, at our studio we prefer to follow the Byzantine tradition and adapt to suit the pixelated nature of mosaic, and create continuous, elegant and flowing lines. Adam, detail. There are numerous ways to shade in mosaic. Here you can see checker boarding (the inside of the tomb); graduated shades of smalti (the coloured glass cubes); and the use of a cooler colours in the depths (blue in the green folds). St John the Baptist, detail. John was the forerunner of Christ both on earth and in Hades. He had to die before Christ in order to prepare those in Hades for the Lord’s coming. Eve and John the Forerunner, detail. In order to create a harmonious colour scheme, we limited our main palette to one third of the colour wheel: deep red, purple and deep blue. 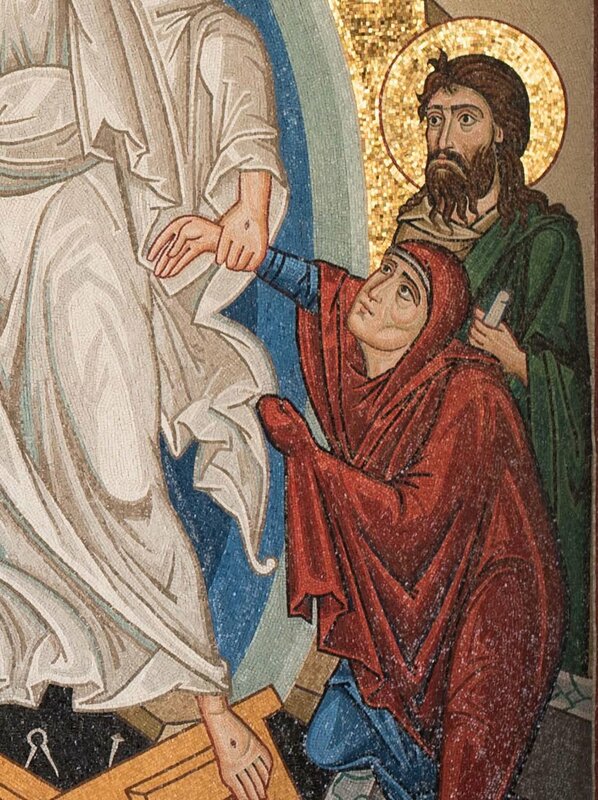 This also helped to make Christ’s white garment appear more radiant by contrast. Resurrection mosaic, south aisle. We make our mosaics to suit the specific space within the church. In this case we tilted the gold tesserae up to 30 degrees to reflect the greatest amount of light from the side window, made of onyx.